With the exception of Tom Moody, who has been a high-level coach, I can’t say for certain that the television analysts quite understand the nuances of the T20 format. Since Andre Russell’s blitzkrieg at the Queen’s Park Oval, they have almost continually complained about the Tallawahs’ batting order. They keep going on about why Russell and Rovman Powell, given their propensity for quick scoring, should not be batting so low down in the order; that they are only at the wicket for a few overs or, worse, do not manage to get in at all. 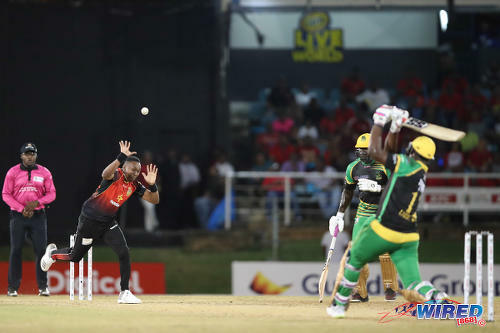 Photo: TKR captain Dwayne Bravo (left) takes evasive action as Jamaica Tallawahs captain Andre Russell smashes for six during their CPL outing at the Queen’s Park Oval on 10 August 2018. There is doubtless some merit in the argument; what doth it profit a franchise, after all, to have batting depth if, time after time, in the pavilion the best batsmen are kept? However, taking that line of argument to its logical conclusion, one might arrive at the view that Powell and Russell should open the batting. Or come in no lower than at three or four respectively. But really, the be-all and end-all of it is simply that, in the T20 format, there are no magic formulae that work every time. 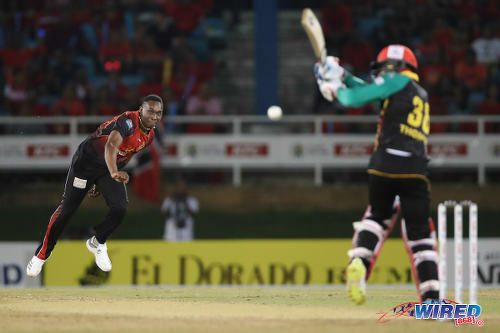 As Russell, the St Lucia Stars’ Kieron Pollard and the Barbados Tridents’ Jason Holder now know to their cost, the skipper must incessantly make judgements—à la Dwayne Bravo—about whom his team needs to be at the wicket or on the ball or even at slip, say, or at deep backward square-leg or at cover-point, at any given moment. And there is a judgement behind Sunil Narine’s continued occupation of the opening slot. Remember that Narine, unlike the Patriots’ Evin Lewis, for example, earns his place in the XI as a specialist off-spinner. Any runs he makes are, in a real sense, a bonus. But because he is capable of contributing massively with the bat—the critics will say that remains to be proven—the skipper has to decide where the weight of his batting contribution is most likely to be greatest. And its loss least damaging. That’s what the Americans call a no-brainer. In a T20 game, there are few certainties. One of them, however, is that only two fieldsmen will be outside the 30-yard circle during the first power play. If a batsman is going, irrespective of the objective conditions, to chance his hand—with Narine, as we have seen, that is not an ‘if’—the best time for him to be in is at the start of the innings. 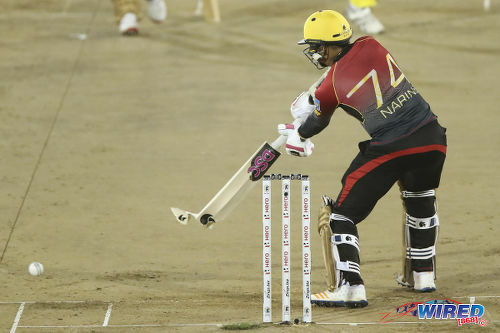 Photo: TKR opener Sunil Narine breaks his bat while attacking a delivery during CPL T20 action against the Jamaica Tallawahs at the Queen’s Park Oval on 9 August 2017. Besides, the current record will show that the TKR opening partnership’s average score is the lowest of the six teams’. Nevertheless, it is Bravo’s team that currently sits at the head of the CPL 2018 standings. So if you’re waiting to see someone else replace the off-spinner at the top of the order, don’t hold your breath; it could be a very long time before you exhale. Similarly, don’t hold your breath while you wait for DJB to find someone else to bowl at the death. In a T20 game, there are few near-certainties; one of them is that if Dwayne Bravo is the captain, he will be bowling over 19 or 20. I’m obviously not condoning; I’m for complete flexibility, elasticity, unpredictability from whoever happens to be the captain. But let us not forget that a cricket match is played in the minds of the opposing captains. And in DJB’s mind, there is no better death bowler than DJB. Is he right? Is his bowling any good? And how does one accurately categorise it? Narine, for example, is an off-spinner, Fawad Ahmed is a leg-spinner, Khary Pierre is a left-arm orthodox bowler and Shannon Gabriel is a pace bowler. Does the tag “medium pacer” really convey anything of what accounts for Bravo’s tremendous T20 success over the years? 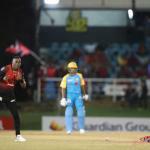 Photo: TKR pacer Shannon Gabriel (right) celebrates the wicket of Jamaica Tallawahs batsman Rovman Powell during CPL action at the Queen’s Park Oval on 10 August 2018. Narine’s success as a bowler—both in terms of wickets captured and of runs conceded—has diminished dramatically in the current season, arguably because his ‘surprise’ ball no longer surprises nearly as much. Half of Ahmed’s eight CPL 2018 wickets have been claimed with the googly, his ‘surprise’ ball. Pierre, who has so far this season claimed four wickets in his two matches, has been used sparingly. Cause and effect? Gabriel has been properly relegated to the bench because he is, almost by definition, out of place in an environment which puts a premium on surprises, on unpredictability. God knows that the pacer will bowl fast and straight. But Bravo also knows it, as does the crowd, the opposing captain and. crucially, the batsman. 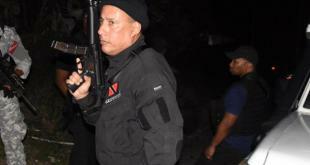 In short, in a T20 game, Gabriel is as big an asset to Trinbago as Stephen Williams was in the fight against crime. It may seem paradoxical but there is a sense in which Bravo as bowler is no less predictable than Gabriel. God, the opposing captain, the crowd and the batsman all know that he is going to bowl not fast and straight but a slower ball. Indeed, despite his “medium pacer” designation, his success comes from the fact that he is little more than a purveyor of slower balls. 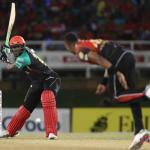 Photo: St Kitts and Nevis Patriots Devon Thomas (right) attempts to flick away a delivery by TKR captain Dwayne Bravo during CPL action at the Queen’s Park Oval on 11 August 2018. Let us, however, ponder on precisely what ‘slower’ really means in that context. Slower than Gabriel? Slower than Narine? Slower than most medium pacers? Slower than he bowled last year? Slower than the last bowler? Slower than the last ball? 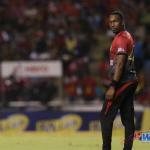 On Sunday, Nicholas Pooran lost his off-stump to DJB while he was trying to work out the answer to those six questions. And Jason Holder got the correct answer but too late for him to leave a clear wide alone. So for as long as batsmen are going to continue to be posing those questions, in the mind of the current TKR captain, there is likely to be the conviction that there is no better bowler at the death than the man who he can guarantee will continue to keep opposing batsmen guessing. Even if some of them, like Russell, contrive once or twice to guess right all innings long. 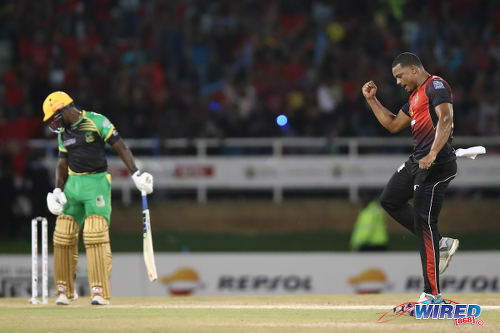 Editor’s Note: Click HERE for the third and final part of this series as Earl Best compares Dwayne Bravo’s captaincy favourably to his regional counterparts.